I represent borrowers, lenders, investors, financial institutions, and private equity firms with structuring, documenting, restructuring and modifying senior and mezzanine, secured and unsecured credit facilities in connection with leveraged buyouts, working capital needs, and acquisition financings. I am a lead advisor at my firm in documenting domestic and international subscription-backed credit facilities. In addition, I represent veterans of Operation Iraqi Freedom and Operation Enduring Freedom in obtaining Combat-Related Special Compensation (CRSC). I represented DLA Piper LLP (US)’s first successful veteran in his receipt of CRSC. I also advise non-profit organizations regarding board governance and formation procedures and filings. I am a certified public accountant, licensed in Illinois. 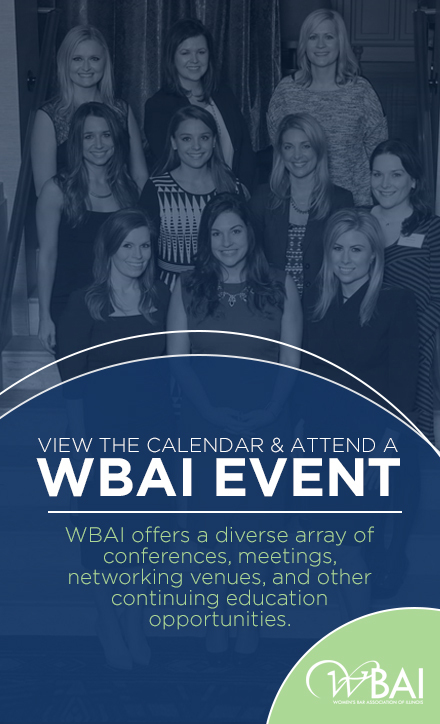 I am a member of the WBAI to meet, learn from and network with women lawyers. I appreciate and look forward to the variety of events and engagements the WBAI provides for training and networking. WBAI sponsored presentations and seminars such as the Women in Law Summit and How to Get the Business: Continued Conversation with Givers and Getters are just a couple of engagements that have been invaluable. It seems in many instances, women lawyers are now “at the table” or included on the crucial or profitable legal teams and transactions. However, once we are there, our input must be sought and appreciated. If not, what’s our purpose on the team? Empowering women involves appreciating their input, insight, and resiliency, allowing them to voice their perspectives, and giving them credit for their input. It encourages me (and I would assume, other women lawyers are as well) when I witness the promotion, appreciation and advancement of fellow women attorneys. What are you most looking forward to in the following year personally? I am looking forward to successfully dog training our newest addition so that he can keep a home!